If you don’t want to purchase a pickpocket-proof purse or shoulder bag you may want to modify your own purse or handbag to make it pickpocket proof. While it may not look as sleek as those anti-theft purses and shoulder bags that were designed specifically to stop pickpocket, this simple modification should do the trick. The two items shown here may be found at your local hardware store. Ideally, your purse should be in your hand, over your arm, over your shoulder or across your body at all times. Across your body is the safest but, even there, pickpockets can slip a hand into your purse and remove your wallet without your noticing it. Try this hack using a swivel clip and split ring you can buy at a home improvement store to keep their hands out. 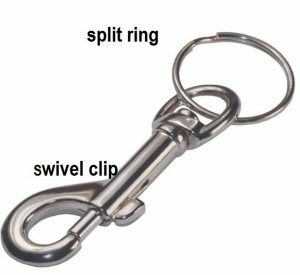 Buy Split Ring and Swivel Clip – One or two split rings, like those in key rings and one swivel snap bolt or swivel clip is all you need. Feed swivel end of a snap bolt into a split ring ( see photo below). Inside your purse, choose a compartment that closes with a zipper where you will keep your wallet and other valuables. Feed the slip ring through the hole in the zipper tab. Note the zipper pull must have a hole in it for this hack to work. Strap Attachment Ring When the zipper is closed, snap the bolt onto the ring that attaches the strap to your purse. If too short to reach, feed the second split ring onto the ring that attaches the strap, and snap the bolt onto that. If the strap does not attach with a ring but is sewn to the purse, buy a large size split ring and feed the entire strap into the ring. Either snap the bolt onto this large ring or feed another small split ring onto the larger ring and snap the bolt onto that.